I’ve got an update on the threat to Wirikuta, a sacred site of the Wixarika (Huichol) people I blogged about the other day, and the news is good! The federal courts have definitively granted the suspension of the violations claimed by the Wixarika (Huichol) People in order that no exploitation permit be granted for the La Luz mining project, in the Municipality of Catorce in San Luis Potosí, so long as the core issue remains unresolved… Click HERE to continue the article on the Wirikuta Defense Front site. This is an important step in resolving this problem for good, but the fight’s not over yet. The pressure to do the right thing here needs to stay on First Majestic and the Canadian and Mexican governments, whether it’s in the courts, on the streets in peaceful protest, online, or in your prayers. Keep it up! Today I came across some interesting news articles documenting the ongoing struggle of the Huichole (Wixáritari) people to protect one of their holiest sites in the state of San Luis Potosí, Mexico. The site in question is a beautiful mountain region named Wirikuta in the Huichol tongue, which Spanish-speakers call Cerro del Quemado. In English, the name is roughly translated as “Burned Mountain,” a fitting name for the place where the sun ascended from the Earth’s surface to the skies in traditional belief. Despite being considered an internationally-recognized protected site by UNESCO and the Mexican government, Wirikuta is currently under threat from foreign mining interests. In 2009, the Canadian mining company, First Majestic Silver Corp., bought mineral rights to the area, and plans extensive extraction of silver, a process which will consume a significant portion of the area’s limited water supply, as well as expose the countryside to dangerous chemicals used in silver mining, such as cyanide, which have a deadly tendency to seep into the groundwater and render it undrinkable. This threat to the mountain and the fragile aquifer rooted at it is all the more horrifying when one recalls that mountains were and still are considered to be hearts of earth and water, or “houses of mist” all across Mesoamerica, a belief uniting the imperial Mexica-Tenochca with their present-day Huichol cousins. Viewed through this lens, it’s not at all surprising that a threat to Wirikuta is a threat to the aquifer and all life in its nourishing influence. In addition to the physical destruction that mining unavoidably brings, there will be spiritual destruction. Wirikuta is home to many sacred plants, such as peyote, animals, and divine beings, particularly deities associated with rain. Destroying the mountain will destroy these creatures and desecrate the site, which will sever the Huichol from their spiritual root. Drawing a Judeo-Christian-Islamic parallel, Dawn Paley likened digging up Wirikuta to “bulldozing Eden for a golf course” in her detailed coverage of this issue in This Magazine. Furthermore, this mountain is not only a place to gather vital religious supplies, but it is also a natural temple, a place to conduct ceremony. Cerro del Quemado, the sacred center of Wirikuta, is the destination of a traditional 800 kilometer yearly pilgrimage conducted by the Huichol people to renew bonds of community and deity. This February, the journey had an additional goal of seeking guidance in protecting the holy ground from destruction, and by extension, themselves — the Huichol view themselves as inseparable from the sacred site so intimately intertwined with their culture and ancestry, and have stated they view First Majestic’s plans to dig as a “war of extermination” against them. The Esperanza Project has a beautiful account of the ceremony held on February 6-7th, 2012, complete with numerous photographs and interviews with several Huichol community leaders and observers about the meeting and the ideas and hope flowing from it. They were kind enough to allow journalists to record some footage of song and ceremony from this holy gathering, which you may watch below. To view video statements by the Huichol against this impending desecration and in support of their traditional spirituality and lifeways, please click HERE. The linked site, www.nierika.info, also contains many interesting articles on this matter if you would like to read more, both in English and in Spanish. Below, for those who wish to learn more, I’ve included a short video discussing this crisis and calling for action. I can’t seem to get it to embed properly, so please click the link below to check it out. You may be wondering where you can go to read and watch more, and learn how you can get involved in putting pressure on First Majestic to abort their plans for this site. I would like to highlight the Wirikuta Defense Front’s excellent site (click for English or Spanish). They are an action group composed of people from the Huichol community, as well as local and international allies, and are seeking volunteers to help. Fantastic news! I recently picked up a copy of John Bierhorst’s English translation of the Ballads of the Lords of New Spain (better known as the codex Romances de los Señores de la Nueva España), and discovered a note in the prefatory material of great interest. The University of Texas and Stanford University have completed an incredibly generous project, something that I’ve been hoping someone would do for years. Enough suspense, I’ll tell you what it is now. Complete, full-text copies of both the Romances and the Cantares online, complete with commentary and material for comparative study of the two song texts, a Nahuatl-English concordance dictionary, relevant photos and scans from various codices relating to poetry and music, and even audio of performances of some of the actual sixteenth-century drum rhythms intended for the teponaztli, or wooden slit drum, based on the only piece of sheet music preserved recording actual Aztec music. Folks, this is a huge deal, I can’t state it strongly enough. 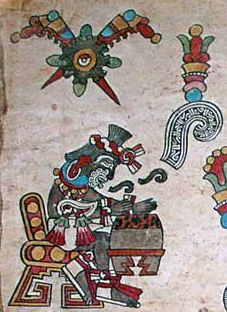 This is the vast majority of pre-Conquest and early Colonial Aztec poetry and song that has been preserved, in English and Nahuatl, searchable and complete, available for absolutely free, for the first time ever. Most of this material has previously been extremely difficult to get a hold of or flat-out unavailable (no complete English edition of the Romances existed before 2009), not to mention expensive. I own a near-mint paper copy of Bierhorst’s translation of the Cantares Mexicanos, which was produced in a limited run by Stanford University and has been out of print since 1985. It took me almost two years of scanning numerous international book selling services online to eventually secure a copy for under $250. You will never have to go through this difficulty and expense to study this collection of breathtakingly-beautiful poetry, as Stanford University has generously put a full copy of the Cantares Mexicanos on this same website in PDF format, that you can download for free. Go HERE to the home page of the Ballads of the Lords of New Spain! And go HERE to download a full PDF copy of the Cantares Mexicanos! Also HERE for a full PDF copy of the Nahuatl-English Concordance & Dictionary volume for the Cantares Mexicanos! Finally, go HERE for a list of post-publishing corrections to the Cantares! In short, many thanks to the University of Texas, Stanford University, and Mr. Bierhorst for making this amazing resource available to all, it’s a move reminiscent of the great wave of public library and museum foundings in the USA in the 19th and early 20th centuries that have been such a force for learning and research. To my readers, I highly encourage you to pick up a print copy of the Ballads in order to support more projects like these in the future, and to give back to those involved in this one. Besides, it’s just nice to have a physical copy of a good book to curl up with. I’ll be back to discuss these two works of Aztec poetry and song later on, but I just couldn’t wait to share these books with you now. Happy reading! All links updated & more materials uploaded by U.Texas linked on 2/24/2013, courtesy of an alert reader. Thanks M.P.! It’s taken a few days, but I’ve finally got the site fully restored and running again, including cleaning up all the links. Fun fact — importing an old WordPress blog onto a new domain, still using their software, doesn’t auto-update links to pages and posts, internal or external. When you realize that is when you also realize just how many links you’ve built up over the course of two years. Good times. On that note, if you spot any broken links while navigating the site, please shoot me a comment or email (cehualli <AT> hotmail <DOT> com), it’ll help me fix anything still wrong faster. Matters of housekeeping aside, I’d also like to point out that I’ve opened the Post-Colonial Modern History page in the History section with its first entry, a collection of John P. Schmal’s papers and research on the numerous indigenous nations within Mexico in the modern era, hosted on Somos Primos. It’s valuable beyond its core informative value as it also serves to highlight the very important fact that, yes, the Aztecs (Mexica), the Maya, the Huaxtecs, and all the other indigenous peoples one frequently reads about in the past are not gone, they are still here, even if the Conquest and incorporation into a modern, European-style Republic has left its mark on their lifeways. This might seem like an odd thing to make a big deal about, but it’s a serious issue when discussing First Nations people, as they’re so often stereotyped as archaic, vanishing, or extinct, creatures of the past, and these aren’t harmless cliches. They hurt people, real, living people. If you’d like to get a bit of an intro on the issue of damaging stereotyping, check out Adrienne K.’s recent posts on her blog, Native Appropriations, HERE and HERE. If you’d like to dig deeper and read a concise paper on the results of a 2008 Stanford University study by Dr. Stephanie Fryburg, please go HERE for a downloadable PDF. It’s been quite some time since we’ve talked, way back in 2009 and on the previous incarnation of this site, Tlacochcalli. A lot has come and gone, but the important thing from your perspective, Dear Reader, is, I’ve decided to pick up the virtual pen once again. Better yet, I’m grabbing the virtual hammer and nails as well to do some renovations. I’ve migrated the bulk of the material from the old blog, with some of the more self-related stuff left out, picked up a new name and domain, and am moving ahead with improving things to get the foundation for future work in order. For those who are curious what I have in mind by “improvements” and “future work,” I’ll sum it up quick (because the sun is rising and I have *got* to get some sleep before work) — I have my eye on filling the niche between sites like FAMSI and Mexicolore. The goal is to combine serious writing on the religion and culture of the Aztecs and their kin with accessibility to those without a Ph.D in anthropology (I would be delighted, of course, for Ph.D holders to jump in to the discussion, so don’t be shy!). In particular, watch for me to continue my habit of sharing data that normally requires access to the holdings of a high-end research university. Though I’ve been quiet the past few years, I haven’t been slacking off in building my own private library, and access to information is something of a pet crusade of mine. But I’ve got to run for now so I don’t fall asleep at my day job! Please update your links to http://www.tlacatecco.com and feel free to poke around the new place, and don’t forget to duck if you see falling verbiage while I’m cleaning things up!